Apple Music is different iTunes. iTunes is all about media ownership, functioning as both a virtual record store and an efficient digital library for music and other media (movies, TV shows, etc) that you own personally. For iTunes users, after you purchased the music files you can burn them as you like. Apple Music is all about streaming. You pay a flat fee to unlock access to Apple Music's entire catalogue, but you don't actually own the music you listen to. During you subscribe the streaming music service, Apple Music lets you save tracks to listen to offline, however you won't own those files and won't be able to offload them anywhere else. You can't burn them onto a disc, use them in separate video projects, or put them on other devices. If you decide to cancel your Apple Music subscription, you'll lose access to those songs. All the limitations limit users. If you want to remove the DRM from Apple Music and then play these Apple music files without limitations any more, how to do? To solve the problems, Macsome iTunes Music Converter comes to help you, which uses high recording and encoding to MP3 or AAC, FLAC and WAV technology to convert these DRM Music files and remove the Apple Music DRM with up to 20X faster conversion speed and as well as CD output quality, and then you can transfer the converted files to Spotify, USB flash Drive, SD card, Google Drive, Andriod Mobile phones and enjoy these files on any audio player devices including Sony PS4, PSP as you like. Apple Music is pre-installed on all Apple devices, and available as a free download for non-Apple PCs and mobile devices. When you sign up for Apple Music, you get a free three month free trial with full access to all of the features. After that, you'll be charged $10 per month unless you cancel. Apple Music costs $9.99 monthly, with a $14.99 family plan option for up to six people. Step 1. 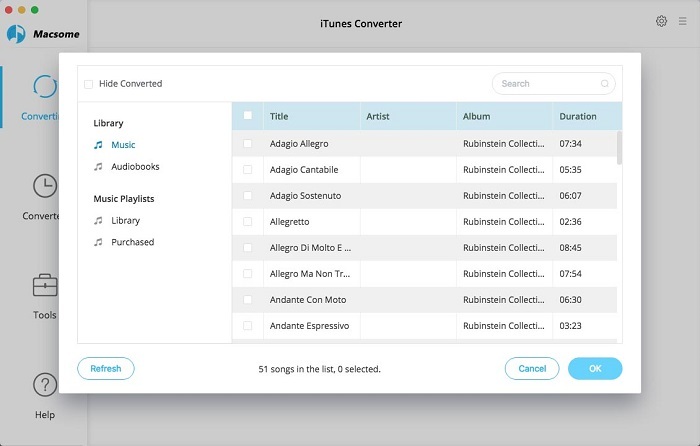 From the next download button to download the latest version of Apple Music Converter for Mac OS X (or Windows version), install and run it. Tips: What you download is a free trial version, that you can only convert 3 minutes each file. If you want to get a full version without limitations, just click the Shopping Cart icon to get the license info including registration name and key. Step 2. Click "+" button to load your Apple Music files. Choose the Music library in the drop-down list, and then choose the Apple Music files you want to convert. 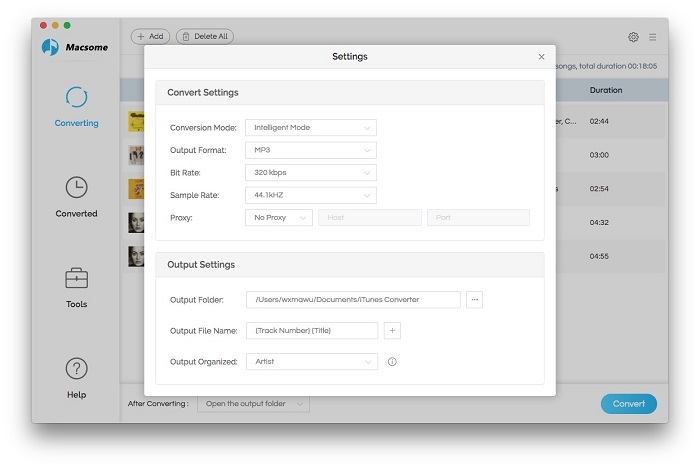 Batch conversion is also supported by Macsome iTunes Converter, you can import several music files and convert them one by one. Step 3. Click "iTunes Converter Menu" - "Preferences" to set the output audio format, or you can click the set icon directly. There are four output formats including MP3, AAC, FLAC, WAV for users to choose. Just choose a suitable audio format according to your need. Step 4. Click "CONVERT" button to start the converting. All the Apple Music files can be converted one by one. After several minutes, you can get the unprotected AAC audio files and play them anytime and anywhere. After the M4P to MP3 Conversion, you can click the Inspector to reset the files' tag info as you need. You can also use the default one. Apple Music is a music streaming service by Apple. 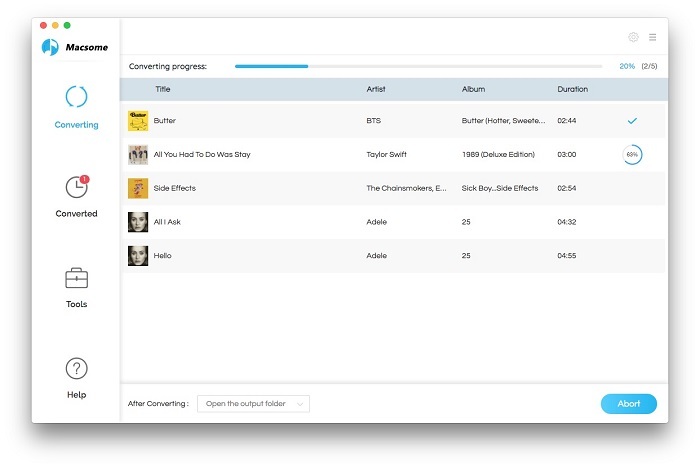 Users select music to stream to their device on demand. The service includes the curated Internet radio station Beats 1 and the blog platform Connect for artists to share media with fans. The app provides music recommendations based on user taste and is integrated with Siri voice commands. It replaces the default music player on iPod Touch units, iPhones and iPads once you upgrade to the latest version of the operating system, iOS 8.4. It is compatible with iOS devices running version 8.4 or later, iTunes version 12.2 or later (OS X Mavericks or later; Windows 7 or later), and the Apple Watch. Access to the Beats 1 radio stream is restricted to the iOS Music app and iTunes logged in with a valid Apple ID. The restriction is enforced by encrypting the live stream with FairPlay DRM. The service is free for three months. After the trial, you will automatically be charged $9.99 a month for an individual plan. A family subscription via iCloud Family Sharing is available for up to six people for $14.99 a month. For the new users, Apple supports three-month free trial of Apple Music. With a paid subscription (or trial), you get all that plus unlimited skips for Apple Music radio stations and the ability to like, comment, play, and save Connect content, listen unlimitedly to the entire Apple Music catalogue, access your purchased and ripped library, stream songs uploaded to iCloud and curated recommendations, and save songs to your library for offline listening. You can access Apple Music via the following devices: iOS devices, Apple Watch, Apple TV, Mac, PC, Android and Sonos. 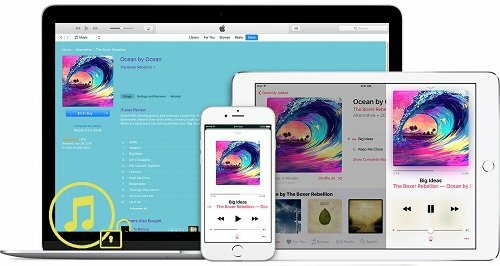 Since Apple Music supports family sharing, users gets kinds of Apple Music files from Apple Music Store, but if you want to play the music on MP3 player, how to do?